I think this book is a little more than that. Wonder is about, a twelve-year-old, who has Treacher Collins syndrome, a rare craniofacial abnormality. Due to this deformity, he undergoes 27 surgeries, and that is why he is homeschooled till fourth-grade. But his mom thinks that it is time to go to school because now he is “a big kid.” He stubbornly accepts and that is when the story actually begins. 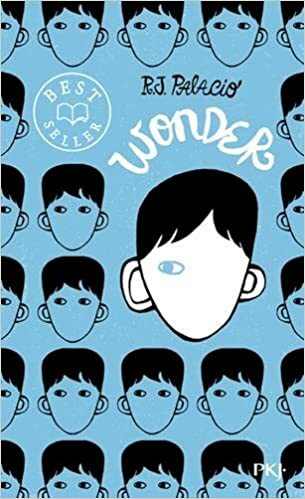 Throughout fifth grade, Auggie meets a few rare children who look past his face and touch his soul. Auggie is truly a good-natured, beautiful, kind boy, and that is how he makes true best-friends. But, unfortunately, he encounters one delinquent, named Julian, who bullies and makes fun of Auggie all the time. Successfully, Auggie defeats the bully with his big heart. This book has a way of expressing such complex feelings with ease, using Auggie and his situation. Throughout the book, you understand what Auggie is going through and connect with him magically. It will be one of those novels that will be read for generations coming, because of the raw truth displayed indeterminately by RJ Palacio. Ikr! It’s a brilliantly written book! Even a movie is coming out! What’s the name to the movie? I would love to! Just send me an email on atmikapai13@gmail.com and I’ll try to help you! .. definitely the book is worth reading 👌👌.. Thank you so much! If you get a chance, please read the book! It is exceptional! The book is good, and the kid in the movie has really good makeup.